A salad as a meal is always delicious and filling—if done right, but often times we have to get ourselves to the point where we want to make them. Desire them. Apply the practice makes perfect mantra and start making your own unforgettable drool worthy greens fest. 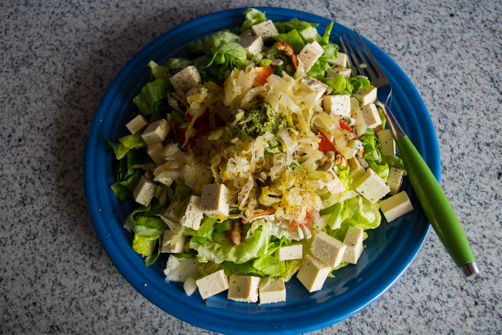 Today’s salad is a medley of Italian flavors starting with the dollop of pesto in the center, a confetti of oregano and basil Italian sauerkraut, and fresh tofu that I swear tastes like fresh mozzarella. This isn’t an exact recipe and it’s not meant to be. Start with a hefty layer of chopped greens. I used a little green leaf lettuce and butter leaf lettuce. 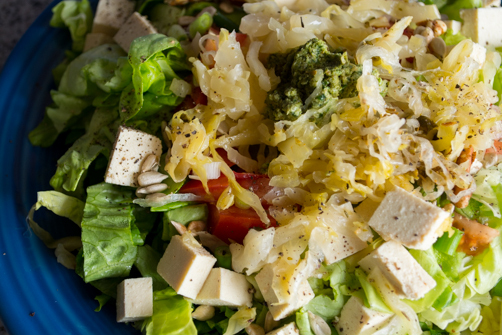 Add half of a chopped tomato, some cubed tofu, a dollop of pesto, sauerkraut (or olives), a sprinkling of toasted sunflower seeds and a dressing of your choice. Drew’s has a great Italian vinaigrette, but a little squeeze of lemon juice would do just fine too. I love to grab a little bit of each ingredient in every bite. Heavenly.